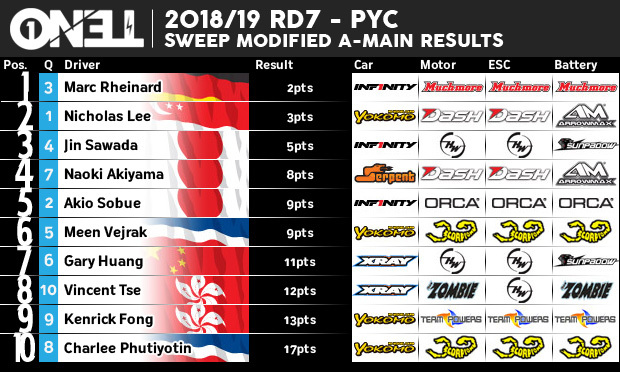 Nicholas Lee has taken the runner up spot at Rd7 of the OneTen series present by Infinity at PYC in Hong Kong. 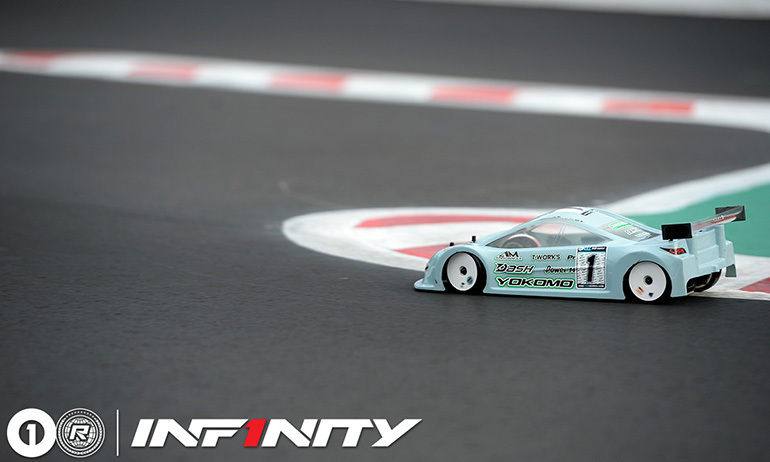 The Yokomo driver took the win in A3 from Marc Rheinard to make up somewhat for his misfortune in A2. 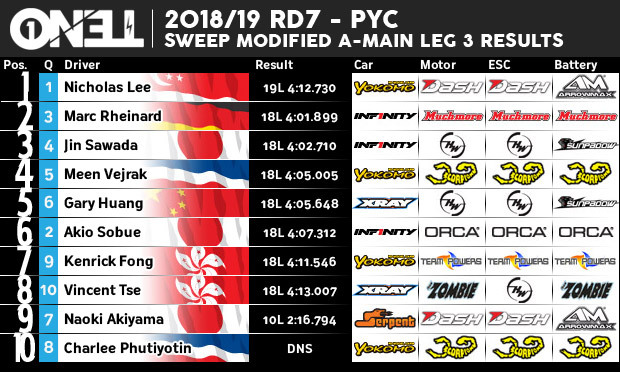 Jin Sawada who ended the day in 3rd place with Naoki Akiyama taking 4th, while the new champion Akio Sobue ended the day in 5th, having another bad run in the last final. 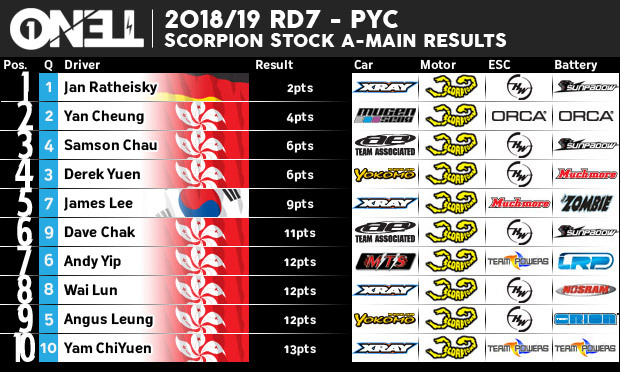 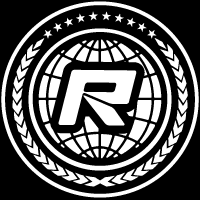 While Xray’s Jan Ratheisky took the win again in today’s final Scorpion Stock A-main, it was Yan Cheung who took the overall runner up spot with his Mugen despite bad luck in the last final which saw him drop to last at the start, only to recover to 6th. 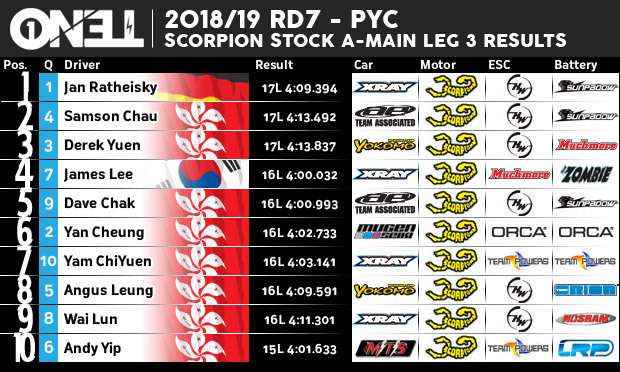 Starting from 4th Samson Chau would take 2nd in A3 with a nice pass on Derek Yuen who took 3rd, the pair ending up 3rd and 4th overall with James Lee from 7th on the grid completing the top 5.